"Burning" redirects here. For the type of injury, see Burn. For combustion without external ignition, see spontaneous combustion. For the vehicle engine, see internal combustion engine. For other uses, see Burning (disambiguation), Combustion (disambiguation), and Firing (disambiguation). "Burning point" redirects here. For the musical group, see Burning Point. 2. The heat of combustion is approximately -418 kJ per mole of O2 used up in the combustion reaction, and can be estimated from the elemental composition of the fuel. x , since the combustion of nitrogen is thermodynamically favored at high, but not low temperatures. Since combustion is rarely clean, flue gas cleaning or catalytic converters may be required by law. Fires occur naturally, ignited by lightning strikes or by volcanic products. Combustion (fire) was the first controlled chemical reaction discovered by humans, in the form of campfires and bonfires, and continues to be the main method to produce energy for humanity. Usually, the fuel is carbon, hydrocarbons or more complicated mixtures such as wood that contains partially oxidized hydrocarbons. The thermal energy produced from combustion of either fossil fuels such as coal or oil, or from renewable fuels such as firewood, is harvested for diverse uses such as cooking, production of electricity or industrial or domestic heating. Combustion is also currently the only reaction used to power rockets. Combustion is also used to destroy (incinerate) waste, both nonhazardous and hazardous. Oxidants for combustion have high oxidation potential and include atmospheric or pure oxygen, chlorine, fluorine, chlorine trifluoride, nitrous oxide and nitric acid. For instance, hydrogen burns in chlorine to form hydrogen chloride with the liberation of heat and light characteristic of combustion. Although usually not catalyzed, combustion can be catalyzed by platinum or vanadium, as in the contact process. x species) form when the air is the oxidant. Combustion is not necessarily favorable to the maximum degree of oxidation, and it can be temperature-dependent. For example, sulfur trioxide is not produced quantitatively by the combustion of sulfur. NOx species appear in significant amounts above about 2,800 °F (1,540 °C), and more is produced at higher temperatures. The amount of NOx is also a function of oxygen excess. 2). On the other hand, when there is insufficient oxygen to completely combust the fuel, some fuel carbon is converted to carbon monoxide and some of the hydrogen remains unreacted. A more complete set of equations for the combustion of a hydrocarbon in the air, therefore, requires an additional calculation for the distribution of oxygen between the carbon and hydrogen in the fuel. The amount of air required for complete combustion to take place is known as theoretical air. However, in practice, the air used is 2-3x that of theoretical air. Incomplete combustion will occur when there is not enough oxygen to allow the fuel to react completely to produce carbon dioxide and water. It also happens when the combustion is quenched by a heat sink, such as a solid surface or flame trap. Same as complete combustion, water is produced by incomplete combustion. However, carbon, carbon monoxide, and/or hydroxide are the products instead of carbon dioxide. For most fuels, such as diesel oil, coal or wood, pyrolysis occurs before combustion. In incomplete combustion, products of pyrolysis remain unburnt and contaminate the smoke with noxious particulate matter and gases. Partially oxidized compounds are also a concern; partial oxidation of ethanol can produce harmful acetaldehyde, and carbon can produce toxic carbon monoxide. The quality of combustion can be improved by the designs of combustion devices, such as burners and internal combustion engines. Further improvements are achievable by catalytic after-burning devices (such as catalytic converters) or by the simple partial return of the exhaust gases into the combustion process. Such devices are required by environmental legislation for cars in most countries and may be necessary to enable large combustion devices, such as thermal power stations, to reach legal emission standards. The degree of combustion can be measured and analyzed with test equipment. HVAC contractors, firemen and engineers use combustion analyzers to test the efficiency of a burner during the combustion process. In addition, the efficiency of an internal combustion engine can be measured in this way, and some U.S. states and local municipalities use combustion analysis to define and rate the efficiency of vehicles on the road today. Carbon monoxide is one of the products from incomplete combustion. Carbon is released in the normal incomplete combustion reaction, forming soot and dust. Since carbon monoxide is considered as a poisonous gas, complete combustion is more preferable, as carbon monoxide may also lead to respiratory troubles when breathed since it takes the place of oxygen and combines with hemoglobin. These oxides combine with water and oxygen in the atmosphere, creating nitric acid and sulfuric acids, which return to Earth's surface as acid deposition, or "acid rain." Acid deposition harms aquatic organisms and kills trees. Due to its formation of certain nutrients which are less available to plants such as calcium and phosphorus, it reduces the productivity of ecosystem and farms. An additional problem associated with nitrogen oxides is that they, along with hydrocarbon pollutants, contribute to the formation of tropospheric ozone, a major component of smog. Breathing carbon monoxide causes headache, dizziness, vomiting, and nausea. If carbon monoxide levels are high enough, humans become unconscious or die. Exposure to moderate and high levels of carbon monoxide over long periods of time are positively correlation with risk of heart disease. People who survive severe CO poisoning may suffer long-term health problems. Carbon monoxide from air is absorbed in the lungs which then binds with hemoglobin in human's red blood cells. This would reduce the capacity of red blood cells to carry oxygen throughout the body. Smouldering is the slow, low-temperature, flameless form of combustion, sustained by the heat evolved when oxygen directly attacks the surface of a condensed-phase fuel. It is a typically incomplete combustion reaction. Solid materials that can sustain a smouldering reaction include coal, cellulose, wood, cotton, tobacco, peat, duff, humus, synthetic foams, charring polymers (including polyurethane foam) and dust. Common examples of smoldering phenomena are the initiation of residential fires on upholstered furniture by weak heat sources (e.g., a cigarette, a short-circuited wire) and the persistent combustion of biomass behind the flaming fronts of wildfires. An experiment that demonstrates the large amount of energy released on combustion of ethanol. 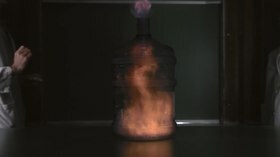 A mixture of alcohol (in this case, ethanol) vapour and air in a large plastic bottle with a small neck is ignited, resulting in a large blue flame and a 'whoosh' sound. Spontaneous combustion is a type of combustion which occurs by self-heating (increase in temperature due to exothermic internal reactions), followed by thermal runaway (self-heating which rapidly accelerates to high temperatures) and finally, ignition. For example, phosphorus self-ignites at room temperature without the application of heat. Organic materials undergoing bacterial composting can generate enough heat to reach the point of combustion. Combustion resulting in a turbulent flame is the most used for industrial application (e.g. gas turbines, gasoline engines, etc.) because the turbulence helps the mixing process between the fuel and oxidizer. The term 'micro' gravity refers to a gravitational state that is 'low' (i.e., 'micro' in the sense of 'small' and not necessarily a millionth of Earth's normal gravity) such that the influence of buoyancy on physical processes may be considered small relative to other flow processes that would be present at normal gravity. In such an environment, the thermal and flow transport dynamics can behave quite differently than in normal gravity conditions (e.g., a candle's flame takes the shape of a sphere.). Microgravity combustion research contributes to the understanding of a wide variety of aspects that are relevant to both the environment of a spacecraft (e.g., fire dynamics relevant to crew safety on the International Space Station) and terrestrial (Earth-based) conditions (e.g., droplet combustion dynamics to assist developing new fuel blends for improved combustion, materials fabrication processes, thermal management of electronic systems, multiphase flow boiling dynamics, and many others). Combustion processes which happen in very small volumes are considered micro-combustion. The high surface-to-volume ratio increases specific heat loss. Quenching distance plays a vital role in stabilizing the flame in such combustion chambers. Diesel engines are run with an excess of oxygen to combust small particles that tend to form with only a stoichiometric amount of oxygen, necessarily producing nitrogen oxide emissions. Both the United States and European Union enforce limits to vehicle nitrogen oxide emissions, which necessitate the use of special catalytic converters or treatment of the exhaust with urea (see Diesel exhaust fluid). 4 can become an important combustion product; when z falls below roughly 35% of the stoichiometric value, elemental carbon may become stable. 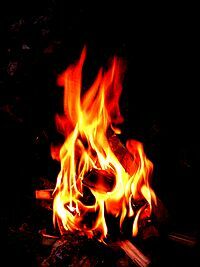 Substances or materials which undergo combustion are called fuels. The most common examples are natural gas, propane, kerosene, diesel, petrol, charcoal, coal, wood, etc. Combustion of a liquid fuel in an oxidizing atmosphere actually happens in the gas phase. It is the vapor that burns, not the liquid. Therefore, a liquid will normally catch fire only above a certain temperature: its flash point. The flash point of a liquid fuel is the lowest temperature at which it can form an ignitable mix with air. It is the minimum temperature at which there is enough evaporated fuel in the air to start combustion. Combustion of gaseous fuels may occur through one of four distinctive types of burning: diffusion flame, premixed flame, autoignitive reaction front, or as a detonation. The type of burning that actually occurs depends on the degree to which the fuel and oxidizer are mixed prior to heating: for example, a diffusion flame is formed if the fuel and oxidizer are separated initially, whereas a premixed flame is formed otherwise. Similarly, the type of burning also depends on the pressure: a detonation, for example, is an autoignitive reaction front coupled to a strong shock wave giving it its characteristic high-pressure peak and high detonation velocity. Charcoal phase or solid phase, when the output of flammable gases from the material is too low for persistent presence of flame and the charred fuel does not burn rapidly and just glows and later only smoulders. Efficient process heating requires recovery of the largest possible part of a fuel’s heat of combustion into the material being processed. There are many avenues of loss in the operation of a heating process. Typically, the dominant loss is sensible heat leaving with the offgas (i.e., the flue gas). The temperature and quantity of offgas indicates its heat content (enthalpy), so keeping its quantity low minimizes heat loss. 4) combustion, for example, slightly more than two molecules of oxygen are required. The second principle of combustion management, however, is to not use too much oxygen. The correct amount of oxygen requires three types of measurement: first, active control of air and fuel flow; second, offgas oxygen measurement; and third, measurement of offgas combustibles. For each heating process, there exists an optimum condition of minimal offgas heat loss with acceptable levels of combustibles concentration. Minimizing excess oxygen pays an additional benefit: for a given offgas temperature, the NOx level is lowest when excess oxygen is kept lowest. 2 in the combustion gas. 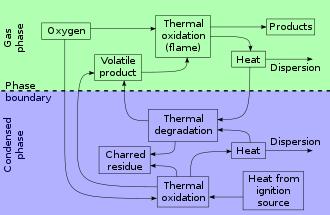 The heat balance relates the heat available for the charge to the overall net heat produced by fuel combustion. Additional material and heat balances can be made to quantify the thermal advantage from preheating the combustion air, or enriching it in oxygen. Combustion in oxygen is a chain reaction in which many distinct radical intermediates participate. The high energy required for initiation is explained by the unusual structure of the dioxygen molecule. The lowest-energy configuration of the dioxygen molecule is a stable, relatively unreactive diradical in a triplet spin state. Bonding can be described with three bonding electron pairs and two antibonding electrons, with spins aligned, such that the molecule has nonzero total angular momentum. Most fuels, on the other hand, are in a singlet state, with paired spins and zero total angular momentum. Interaction between the two is quantum mechanically a "forbidden transition", i.e. possible with a very low probability. To initiate combustion, energy is required to force dioxygen into a spin-paired state, or singlet oxygen. This intermediate is extremely reactive. The energy is supplied as heat, and the reaction then produces additional heat, which allows it to continue. Solid and heavy liquid fuels also undergo a great number of pyrolysis reactions that give more easily oxidized, gaseous fuels. These reactions are endothermic and require constant energy input from the ongoing combustion reactions. A lack of oxygen or other poorly designed conditions result in these noxious and carcinogenic pyrolysis products being emitted as thick, black smoke. The rate of combustion is the amount of a material that undergoes combustion over a period of time. It can be expressed in grams per second (g/s) or kilograms per second (kg/s). Detailed descriptions of combustion processes, from the chemical kinetics perspective, requires the formulation of large and intricate webs of elementary reactions. For instance, combustion of hydrocarbon fuels typically involve hundreds of chemical species reacting according to thousands of reactions. Inclusion of such mechanisms within computational flow solvers still represents a pretty challenging task mainly in two aspects. First, the number of degrees of freedom (proportional to the number of chemical species) can be dramatically large; second, the source term due to reactions introduces a disparate number of time scales which makes the whole dynamical system stiff. As a result, the direct numerical simulation of turbulent reactive flows with heavy fuels soon becomes intractable even for modern supercomputers. The invariant constrained equilibrium edge preimage curve method. The Computational Singular perturbation (CSP) method and further developments. The Rate Controlled Constrained Equilibrium (RCCE) and Quasi Equilibrium Manifold (QEM) approach. The Method of Invariant Grids (MIG). The kinetic modelling may be explored for insight into the reaction mechanisms of thermal decomposition in the combustion of different materials by using for instance Thermogravimetric analysis. 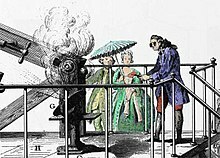 Antoine Lavoisier conducting an experiment related to combustion generated by amplified sun light. ), around 2,150 °C (3,902 °F) for oil and 2,000 °C (3,632 °F) for natural gas. In industrial fired heaters, power station steam generators, and large gas-fired turbines, the more common way of expressing the usage of more than the stoichiometric combustion air is percent excess combustion air. For example, excess combustion air of 15 percent means that 15 percent more than the required stoichiometric air is being used. Combustion instabilities are typically violent pressure oscillations in a combustion chamber. These pressure oscillations can be as high as 180 dB, and long-term exposure to these cyclic pressure and thermal loads reduce the life of engine components. In rockets, such as the F1 used in the Saturn V program, instabilities led to massive damage to the combustion chamber and surrounding components. This problem was solved by re-designing the fuel injector. In liquid jet engines, the droplet size and distribution can be used to attenuate the instabilities. Combustion instabilities are a major concern in ground-based gas turbine engines because of NOx emissions. The tendency is to run lean, an equivalence ratio less than 1, to reduce the combustion temperature and thus reduce the NOx emissions; however, running the combustion lean makes it very susceptible to combustion instability. where q' is the heat release rate perturbation and p' is the pressure fluctuation. When the heat release oscillations are in phase with the pressure oscillations, the Rayleigh Index is positive and the magnitude of the thermo acoustic instability is maximised. On the other hand, if the Rayleigh Index is negative, then thermoacoustic damping occurs. The Rayleigh Criterion implies that a thermoacoustic instability can be optimally controlled by having heat release oscillations 180 degrees out of phase with pressure oscillations at the same frequency. This minimizes the Rayleigh Index. ^ a b The formation of NOx. Alentecinc.com. Retrieved on 2010-09-28. ^ "Burning showing incomplete combustion". ^ a b "Environmental Problems associated with incomplete combustion". ^ "A Perfect Storm: Mulch Fire Dynamics and Prevention". Soilandmulchproducernews.com. Retrieved 2018-07-12. ^ Shuttle-Mir History/Science/Microgravity/Candle Flame in Microgravity (CFM) – MGBX. Spaceflight.nasa.gov (1999-07-16). Retrieved on 2010-09-28. ^ ASM Committee on Furnace Atmospheres, Furnace atmospheres and carbon control, Metals Park, OH . ^ "Exothermic atmospheres". Industrial Heating: 22. June 2013. Retrieved 5 July 2013. ^ "Reaction-Web". Crct.polymtl.ca. Retrieved 2018-07-12. ^ a b Bradley, D (2009-06-25). "Combustion and the design of future engine fuels". Proceedings of the Institution of Mechanical Engineers, Part C: Journal of Mechanical Engineering Science. 223 (12): 2751–2765. doi:10.1243/09544062jmes1519. ^ "Calculating the heat of combustion for natural gas". Industrial Heating: 28. September 2012. Retrieved 5 July 2013. ^ "Making a material balance". Industrial Heating: 20. November 2012. Retrieved 5 July 2013. ^ "Making a heat balance". Industrial Heating: 22. December 2012. Retrieved 5 July 2013. ^ "Available combustion heat". Industrial Heating: 22. April 2013. Retrieved 5 July 2013. ^ "Making a system balance (Part 2)". Industrial Heating: 24. March 2012. Retrieved 5 July 2013. ^ "Making a system balance (Part 1)". Industrial Heating: 22. February 2012. Retrieved 5 July 2013. ^ Law, C.K. (2006). Combustion Physics. Cambridge, UK: Cambridge University Press. ISBN 9780521154215. ^ Goussis, D.; Maas, U. (2011). Turbulent Combustion Modeling. Springer Science. pp. 193–220. ^ Chiavazzo, Eliodoro; Karlin, Ilya (2011). "Adaptive simplification of complex multiscale systems". Phys. Rev. E. 83 (3): 036706. arXiv:1011.1618. Bibcode:2011PhRvE..83c6706C. doi:10.1103/PhysRevE.83.036706. PMID 21517624. ^ Chiavazzo, Eliodoro; Asinari, Pietro; Visconti, Filippo (2011). "Fast computation of multi-scale combustion systems". Phil. Trans. Roy. Soc. A. 369 (1945): 2396–2404. arXiv:1011.3828. Bibcode:2011RSPTA.369.2396C. doi:10.1098/rsta.2011.0026. PMID 21576153. ^ Chiavazzo, Eliodoro (2012). "Approximation of slow and fast dynamics in multiscale dynamical systems by the linearized Relaxation Redistribution Method". Journal of Computational Physics. 231 (4): 1751–1765. arXiv:1102.0730. Bibcode:2012JCoPh.231.1751C. doi:10.1016/j.jcp.2011.11.007. ^ Kooshkbaghi, Mahdi; Frouzakis, E. Christos; Chiavazzo, Eliodoro; Boulouchos, Konstantinos; Karlin, Ilya (2014). "The global relaxation redistribution method for reduction of combustion kinetics". The Journal of Chemical Physics. 141 (4): 044102. Bibcode:2014JChPh.141d4102K. doi:10.1063/1.4890368. ^ Maas, U.; Pope, S.B. (1992). "Simplifying chemical kinetics: intrinsic low-dimensional manifolds in composition space". Combust. Flame. 88 (3–4): 239–264. doi:10.1016/0010-2180(92)90034-m.
^ Bykov, V.; Maas, U (2007). "The extension of the ILDM concept to reaction–diffusion manifolds". Combust. Theory Model. 11 (6): 839–862. Bibcode:2007CTM....11..839B. doi:10.1080/13647830701242531. ^ Nafe, J.; Maas, U. (2002). "A general algorithm for improving ILDMs". Combust. Theory Model. 6 (4): 697–709. Bibcode:2002CTM.....6..697N. doi:10.1088/1364-7830/6/4/308. ^ Ren, Z.; Pope, S.B. ; Vladimirsky, A.; Guckenheimer, J.M. (2006). "The invariant constrained equilibrium edge preimage curve method for the dimension reduction of chemical kinetics". J. Chem. Phys. 124 (11): 114111. Bibcode:2006JChPh.124k4111R. doi:10.1063/1.2177243. ^ Lebiedz, D (2010). "Entropy-related extremum principles for model reduction of dissipative dynamical systems". Entropy. 12 (4): 706–719. Bibcode:2010Entrp..12..706L. doi:10.3390/e12040706. ^ Reinhardt, V.; Winckler, M.; Lebiedz, D. (112). "Approximation of slow attracting manifolds in chemical kinetics by tra trjectory-based optimization approaches" (PDF). J. Phys. Chem. A. 112 (8): 1712–1718. Bibcode:2008JPCA..112.1712R. doi:10.1021/jp0739925. ^ Lam, S.H. ; Goussis, D. (1991). Conventional Asymptotic and Computational Singular Perturbation for Symplified Kinetics Modelling. Berlin: Springer. ^ Valorani, M.; Goussis, D.; Najm, H.N. (2005). "Higher order corrections in the approximation of low-dimensional manifolds and the construction of simplified problems with the csp method". J. Comput. Phys. 209 (2): 754–786. Bibcode:2005JCoPh.209..754V. doi:10.1016/j.jcp.2005.03.033. ^ Keck, J.C.; Gillespie, D. (1971). "Rate-controlled partial-equilibrium method for treating reacting gas mixtures". Combust. Flame. 17. ^ Chiavazzo, Eliodoro; Karlin, Ilya (2008). "Quasi-equilibrium grid algorithm: geometric construction for model reduction". J. Comput. Phys. 227 (11): 5535–5560. arXiv:0704.2317. Bibcode:2008JCoPh.227.5535C. doi:10.1016/j.jcp.2008.02.006. ^ Valorani, M.; Paolucci, S. (2009). "The G-Scheme: a framework for multi-scale adaptive model reduction". J. Comput. Phys. 228 (13): 4665–4701. Bibcode:2009JCoPh.228.4665V. doi:10.1016/j.jcp.2009.03.011. ^ Chiavazzo, Eliodoro; Karlin, Ilya; Gorban, Alexander (2010). "The role of thermodynamics in model reduction when using invariant grids" (PDF). Commun. Comput. Phys. 8: 701–734. CiteSeerX 10.1.1.302.9316. doi:10.4208/cicp.030709.210110a. ^ Chiavazzo, Eliodoro; Karlin, Ilya; Frouzakis, Christos E.; Boulouchos, Konstantinos (2009). "Method of invariant grid for model reduction of hydrogen combustion". Proceedings of the Combustion Institute. 32: 519–526. arXiv:0712.2386. doi:10.1016/j.proci.2008.05.014. ^ Chiavazzo, Eliodoro; Karlin, Ilya; Gorban, Alexander; Boulouchos, Konstantinos (2010). "Coupling of the model reduction technique with the lattice Boltzmann method for combustion simulations". Combust. Flame. 157 (10): 1833–1849. doi:10.1016/j.combustflame.2010.06.009. ^ Reyes, J.A. ; Conesa, J.A. ; Marcilla, A. (2001). "Pyrolysis and combustion of polycoated cartons recycling. kinetic model and ms analysis". Journal of Analytical and Applied Pyrolysis. 58-59: 747–763. doi:10.1016/S0165-2370(00)00123-6. ^ "Adiabatic flame temperature". Industrial Heating: 20. May 2013. Retrieved 5 July 2013. ^ A. A. Putnam and W. C. Dennis (1953) "Organ-pipe oscillations in a flame-filled tube," Fourth Symposium (International) on Combustion, The Combustion Institute, pp. 566–574. ^ Chrystie, Robin S. M.; Burns, Iain S.; Kaminski, Clemens F. (2013). "Temperature Response of an Acoustically Forced Turbulent Lean Premixed Flame: A Quantitative Experimental Determination". Combustion Science and Technology. 185: 180–199. doi:10.1080/00102202.2012.714020. Look up combustion in Wiktionary, the free dictionary. Poinsot, Thierry; Veynante, Denis (2012). Theoretical and Numerical Combustion (3rd ed.). European Centre for Research and Advanced Training in Scientific Computation. Lackner, Maximilian; Winter, Franz; Agarwal, Avinash K., eds. (2010). Handbook of Combustion, 5 volume set. Wiley-VCH. ISBN 978-3-527-32449-1. Baukal, Charles E., ed. (1998). Oxygen-Enhanced Combustion. CRC Press. Glassman, Irvin; Yetter, Richard. Combustion (Fourth ed.). Ragland, Kenneth W; Bryden, Kenneth M. (2011). Combustion Engineering (Second ed.). Baukal, Charles E. Jr, ed. (2013). "Industrial Combustion". The John Zink Hamworthy Combustion Handbook: Three-Volume Set (Second ed.). Gardiner, W. C. Jr (2000). Gas-Phase Combustion Chemistry (Revised ed. ).